Her latest recording, SEINN, is released on September 18. It reflects the great love and respect that Mary Jane and Wendy have for Nova Scotia tradition, and for each other. The record achieves a delicate balance between the musical sensibilities of two artists, showcasing traditional and original compositions among the melancholy of Gaelic song and the joy of fiddle tunes. Some of the material was learned from the recordings of older Cape Breton singers and fiddlers, some songs were chosen from existing repertoires, and some were written specifically for this project. The record fuses Roots arrangements with a traditional presentation, capturing the enjoyment and fun that Mary Jane and Wendy have together on and off the stage. Òrain Ghaidhlig (Gaelic Songs of Cape Breton), focuses on the songs and poetry which are the cornerstone of this tradition. This recording remains true to the simple sharing of music that is the foundation of Gaelic culture – from the engaging milling songs performed by a group of Cape Breton’s finest traditional Gaelic singers to the lively old style fiddling of Joe Peter MacLean, a musician never before captured on recording. Recorded at the beautiful North River Church in Cape Breton, this enhanced cd also features visuals taken during the recording sessions. 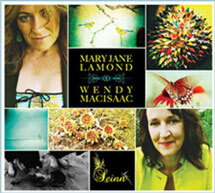 Mary Jane’s solo recording, Stòras (Gaelic meaning “a treasure”), is a beautiful interpretation of some of the Scottish Gaelic songs that have become part of Nova Scotia’s Gaelic tradition. Her use of modern instrumentation and arrangements provides a respectful and beautiful framework for these Gaelic treasures but it is Mary Jane’s spell binding vocal performance and heartfelt delivery that makes these selections truly come alive for the listener.